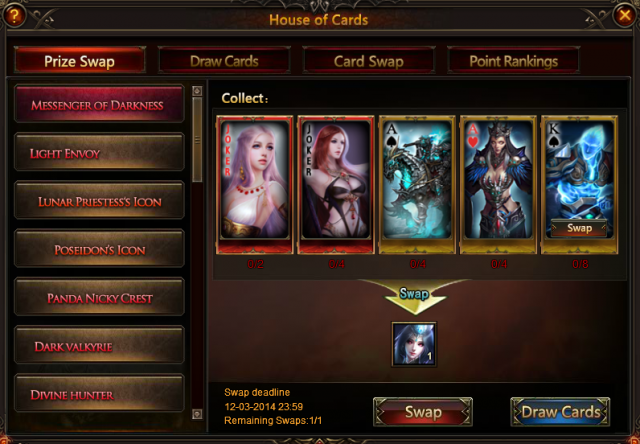 - You can swap the required cards for: Messenger of Darkness, Light Envoy, Lunar Priestess, Poseidon, Panda Nicky, Dark Valkyrie, Divine Hunter, Thunder Lord, Lvl. 8 Hit+Crit Gem, Lvl. 8 PATK+Crit Gem, Lvl. MATK+Crit Gem, Ruby Herosoul, Gem Enhancement Stone, Runestone, Lvl. 7 Cherubstone, Seraph's Stone, Element Crystal, Gem Essence, Topaz Herosoul, Blessed Stone, Refining Stone, Angel Tears, Synth Scroll and many more! Possible Prize: Card Lotto Voucher, Legacy Fashion, Seraph's Stone, Blessed Stone, Gem Enhancement Stone, Aegis Shard, and Totem Badge. Description: Log in every day to win Treasure Chest! More exciting events are coming up through Nov. 27 to Dec. 1, check them out in the in-game How Events menu now!